Fall in is in the air!!!! And also on the Internet. Lots of wonderful fall recipe are blowing up all over blogs and website. As each season changes so does our favorite dishes. We ease out of summer grilling and slide into comforting fall favorites. As the leaves change so do our taste buds. As soon as the weather gets colder I crave comforting soups, stews and hearty chili dishes. Chili is the ultimate cold-weather comfort food that everyone loves. It's really simple to make and perfect for feeding a crowd. Traditional ground beef chili is a favorite in my house, but it's nice to experiment with something different every once in a while. 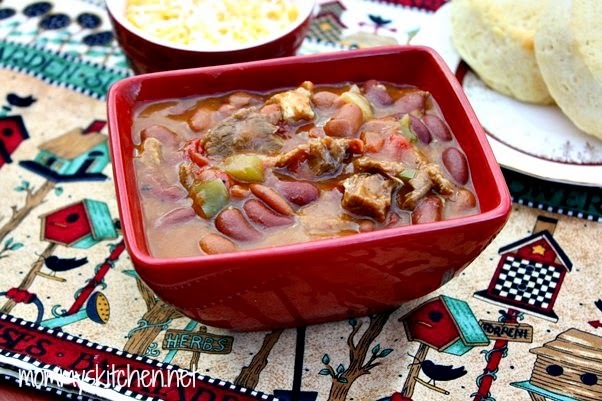 Today I'm sharing a recipe sponsored by Bush's Beans. It's definitely cold here in Texas, so a nice bowl of chili was on the menu this past weekend. I also stepped out of my comfort zone and tried a non traditional chili recipe for Pulled Beef & Bean Chili. The original recipe is for pulled pork, but I had leftover barbecue pulled beef in the freezer and I thought it would work just as well. The flavor combinations is what intrigued me most about this recipe. 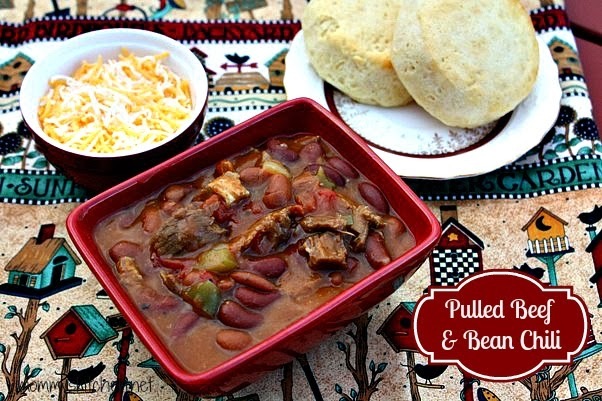 Pulled Beef & Bean Chili is simple to make and uses two kinds of beans, kidney beans and chili beans mixed together with, onions, garlic, green peppers, tomatoes, spices, and tender pulled beef (you can also use pulled pork). I chose to cook this recipe in my crock pot since we were going to be out and about. There's minimal prep work so everything came together rather quickly. Start by sauteing the onions, garlic, and green peppers together in a bit of olive oil. Add the spices, tomatoes, pulled pork, chicken stock, hot sauce, and drained and rinsed beans. From here I just added the chili mixture into my crock pot and cooked it on low for 3 hours. I served this chili with some corn biscuits and everyone loved it. The barbecue beef complimented the chili perfectly. This would be the perfect for your next football game, Fall meal or Halloween night. Heat oil in a 4-quart saucepan over medium heat. Add onion, garlic, green pepper and dried seasonings. Cook 5 minutes; stir often. Stir in tomatoes and pulled pork. Add chicken stock, hot sauce and beans. Bring to simmer. Cook 20-25 minutes. Serve topped with sour cream, cilantro and cheese. Crock Pot Version: Heat oil in a 4-quart saucepan over medium heat. Add onion, garlic, green pepper and dried seasonings. Cook 5 minutes; stir often. Stir in tomatoes and pulled pork. Add chicken stock, hot sauce and beans. Add the mixture to a 6 quart crock pot and cook on low for 3 hours. Cook's Note: If the chili is not thick enough for your taste add 2 tablespoons flour to a small bowl and add enough water to form a paste. Add the flour mixture to the chili in the last hour. Mix to blend. Disclosure: This post is sponsored by Bush's Beans. I am a brand ambassador and the opinions stated above are 100% entirely my own. This looks amazing. I am going to have to add this to my menu plan soon. We are a chili loving family in this house and are always looking for new ways to indulge in our favorite food. Sounds really delicious, thanks for sharing this recipe.